Google Thewallinna and other creatures: The need for tweed! If you passed by this piece of Chanel tweed in a fabric shop, what would your reaction be? Mine was: WOW, thinking about both the beauty of the fabric and the price. Many wonderful garments which could be made from this tweed flashed through my head, but buying two or three yards of this fabric was out of my budget. But then Marina rescued the situation and said, What if you made a bustier? So a bustier it was! Light, smooth and cuddly, this tweed worked perfectly for a bustier. I used only 37cm out of the 70cm which I purchased. The bustier is based on V8766, with a couple of modifications: I moved the zipper to the left and created princess seams on the back, using six pieces in total (one front piece, one back piece and four side pieces). If you are going to make a garment with boning, I cannot recommend enough this spiral boning, sold by the metre. You cut only as much as you need for one seam and then close it with a special metal tip. When moving in my bustier I don't feel any discomfort. Double thumbs up! I started to sew this bustier at my friend Judith's house in Montreal. It was so great to spend the entire week sewing together! We brainstormed different ideas for both our garments (Judith was re-fashioning her bombshell dress). If not for her, I'd have spent weeks working on it by myself. 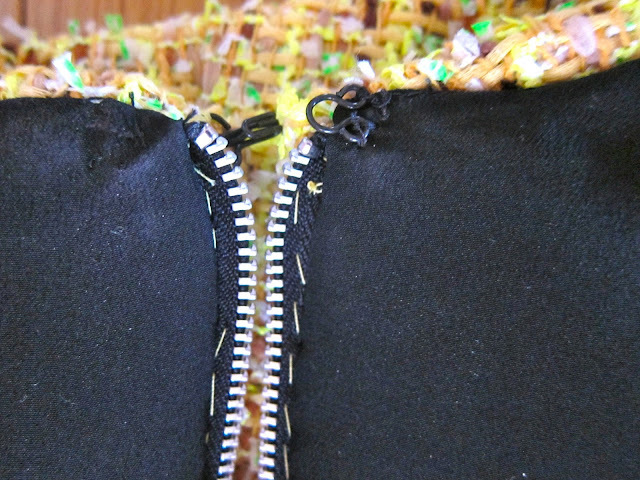 The construction of the bustier is quite interesting: it contains four layers of fabric, plus boning. 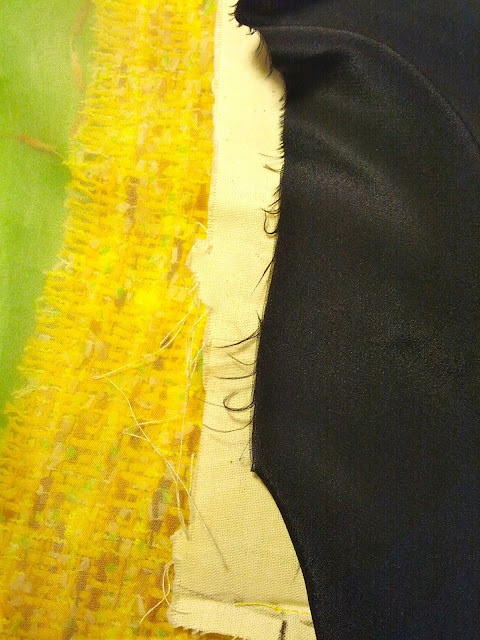 I needed to stabilize the tweed in order to prevent it shifting or distorting. In the classic French jacket which I made before, the fashion fabric was quilted to the lining. But this could not be done for a bustier because it required an intermediate layer of fabric to which the boning could be attached. So first of all, I quilted the tweed to the silk organza! Lightweight but stiff, the organza created a firm shape for the bustier. The third layer of fabric was muslin, chosen because it is strong yet flexible. To attach the boning, I used the method explained by Gertie in her bombshell dress Craftsy lesson. The last layer was the lining, crêpe-de-chine. I don't know whether this photo is clear enough to show the inside of the bustier, but I have included it anyway. The silk organza is transparent but you can see how it blurs the tweed. I also added a hook and eye on the top of zipper to avoid gapping. I have to admit that personally I don't enjoy looking at girls with bad postures like mine wearing bustiers. Seeing a woman with a slouchy back wearing a bustier breaks my heart. Needless to say, looking at my reflection in the mirror made me feel miserable. My first reaction to correct shape of the bustier was to add cups. I considered this idea for more than a week but ultimately decided against it. Instead, I looked for more ideas on how to make the bustier look better on me. 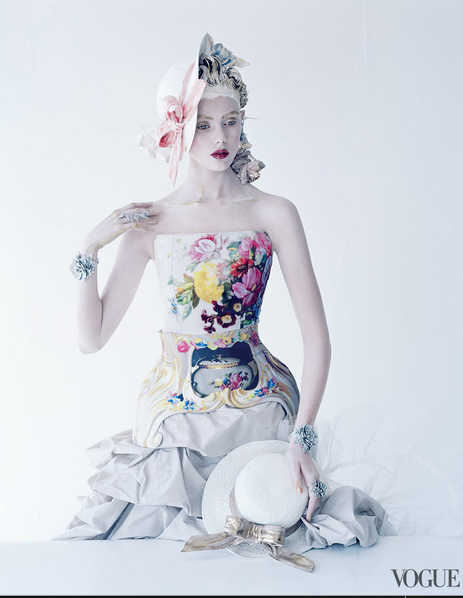 Among the hundreds of photos which I browsed through on the Internet, I found this corsetry archives slideshow in Vogue where a few girls are wearing similar types of corset/bustier and looking kind of cute. 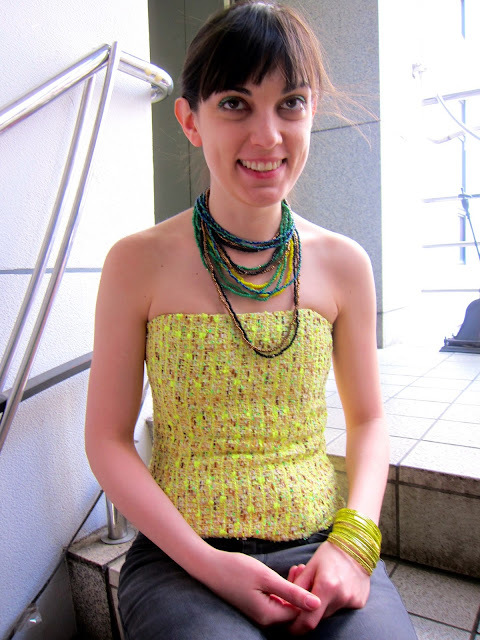 But instead of painting my body white, I liked the idea of wearing a big necklace to fill the open area at the front. All in all, I like the bustier but won't wear it a lot. Despite working on trying to keep my back straight through hours of yoga, some bones are impossible to re-position. If I wear the bustier again, I'd pair it with a bolero or a shrug and a big necklace. I loved tackling the boning and brainstorming the construction of the garment was the most interesting part of the entire sewing process. 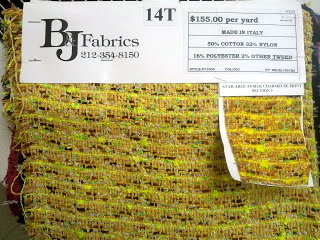 And I can't wait to find another cute fabric to use with the remaining 33cm of my Chanel tweed. How about you? Are there any garments which you had fun sewing but were not sure you'd wear afterwards? AAAAAAHHH, I love this too much. I would definitely have bought it. Yes, probably only a tiny bit too. It looks great on. You should also wear it under a jacket. Awesome! Nobody will ever notice your back when you wear that bodice! We often are far too critical of ourselves seeing things that no one else notices!! The bustier is adorable. Well done! You don't wear it a lot? Why the hell not? You have the shoulders and your posture isn't bad at all. 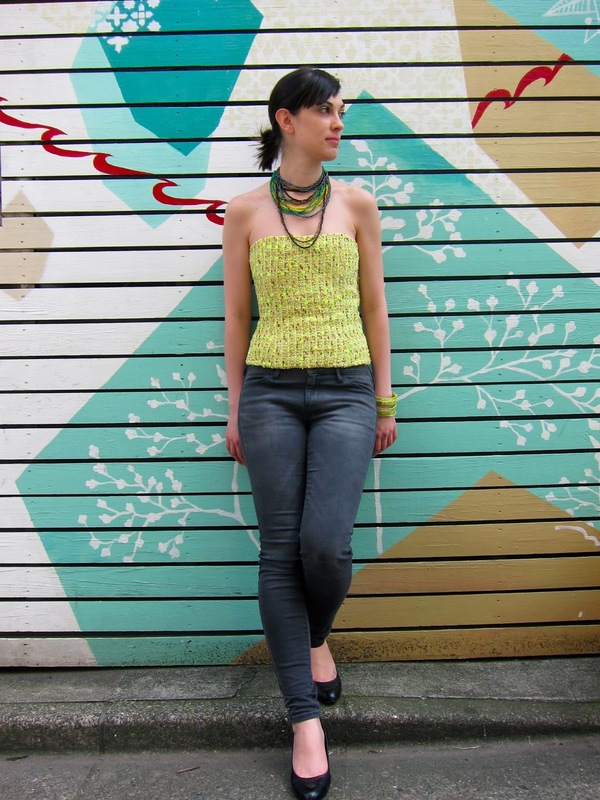 What I love about this project is that it's taken something that is usually associated with couture - tweed fabric - and made it everyday by pairing it with jeans, a beaded necklace, and flats. You look awesome! Love love love it! Even better than I imagined....I would wear this all the time, its gorgeous. Awwww, thanks a lot! I tried it with the jacket but visually it creates a huge yellow spot! But I am sure I'll make more jackets! Thanks Maddie! Wearing this bustier put me way outside my comfort zone. I'll try to wear it more often and maybe this will change the perception of my own image in my head. Because you are Miss Glamour! I hear you! Tweeds and buclés are the most cuddly fabric in the world! I like the combination of tweed and silk - it's heavenly! Exposing too much skin (shoulders or legs) has never been my fashion style, but I feel like I should try a little ;) Regarding the move, the date is still unclear because of the bureaucracy and other horrible administrative obstacles. So no rush with the order! I hope to keep my Etsy shop after the move and add even more Japanese products to the current ones. I see you divine and beautiful, all you need is to go to a fashion show!!!! This piece of tweed is awesome, I love it! If you're not comfortable with it, put on a bolero and that's it, but please do not leave it in the closet! Have you got a denim jacket? It would look super cool with one. haha :) I love it! Fair enough, tweed is supposed to be made of wool and not the crap I bought in NY :( But since I do love flashy colors, I am not sure whether I can find flashy yellow tweed in the UK :S Tweed can be a great topic for one of my next posts and I am jumping into the research! I am so looking forward to discover the woolen paradise of Scotland, especially because I love knitting too! When I move, I'll make sure we meet for a pint! Thanks, dear Maider! Now I have to sew little boleros in different colors! Do you think ballerinas have perfect posture? (•ิ_•ิ)? The more I look at the zipper the more I agree with you :) It looks kind of rock'n'roll (in a very good sense). This is so cool! These bright tweedy fabrics are really your signature look, and you've taken this to a super cool new level! I love the unusual combination of fabric to silhouette-- super rad! I just found your blog and stumbled onto this page. Your bustier is fantastic and looks great on you. I love the suggestion of wearing it with a jean jacket or something else completely unexpected (leather motorcycle jacket?). Not that the peeking zipper is an issue as it does add a certain vibe to piece but if you wanted to avoid it, you might want to try relieving the stress on that seam by having a stay under your bust and at your waist made from heavy elastic or petersham. This would ensure that the stays take the stress while the fabric drapes itself to you without strain. Adwords. Anyway I'm adding this RSS to my email and can look out for much more of your respective fascinating content. Make sure you update this again very soon. deep cuts as these are difficult to repair. most advanced in the world today. A person necessarily lend a hand to make significantly posts I'd state. This is the first time I frequented your web page and up to now? I surprised with the analysis you made to create this actual put up amazing. Magnificent job!